Tuesday night: Chilly and mostly clear. Lows near 20. 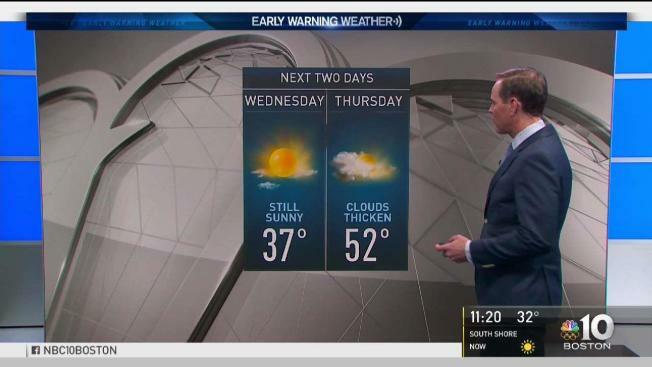 Wednesday: Increasing clouds through the day. Highs in the 30s. Although much attention is on the thaw that has begun after a record stretch of sub-20, sub-freezing and sub-40 degree daily high temperatures, a subtle but meaningful cold front is easing south across New England today. This renewed but short-lived push of cold air will drop overnight with low temperatures into the teens for most, making Wednesday a colder start than Tuesday and keeping high temperatures a few degrees cooler. Nonetheless, the new air will be dry, which means we continue with a quiet stretch of weather... even into Thursday when clouds increase but little more than a rain shower across far northern or western New England is expected. Our next rainmaker arrives Friday — complete with a stiff southerly wind that will boost temperatures into the 50s in Central and Southern New England. Even with warmth and rain, our snowpack isn’t "ripe", meaning it isn’t ready to melt — it’ll absorb the rain and compact as temperatures warm. Limited snowmelt will keep our rivers from flooding, so right now we’ll watch a few smaller rivers like the Suncook River in New Hampshire, but no substantial or widespread river flooding is likely, though clogged storm drains may result in ponding of water on roadways. A slow cold front sags south over New England Saturday with another storm center rippling along it, meaning a rain/snow/ice mix, with the rain/ice boundary likely to set up somewhere near southern New Hampshire, but it’s too early to say for certain. Sunday brings drying and the start to more wintry air for next week in the exclusive Early Warning Weather 10-day.